A 25-mile network of trails known as the Boise River Greenbelt showcases the Boise River. There are paved trails on either side of the river, numerous bridges for crossings (including some pedestrian only bridges), and several spur trails that radiate from the main trail as part of Boise’s ‘Ridge to Rivers’ trail network. We’ve included a trail map of the Greenbelt, which shows major landmarks and bridges. A good reference point is Capitol Blvd., right downtown. Heading east, it is 5.5 miles to Barber Park. Heading west, it’s 3.5 miles to the Athletic Complex and 4.3 miles to Silver Lake. One can run even further west, where the trail is a little more rugged and not 100% seamless. Add-Ons: Spur out to Ann Morrison Park, which has numerous natural surface trails. 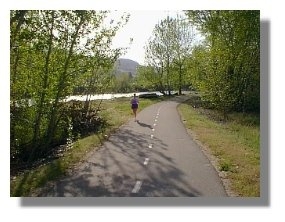 Or the campus of Boise State, which has a pleasant campus for running. Capitol Blvd. is a good reference point.